Aotearoa Poet Laureate (2017-19) Selina Tusitala Marsh recently visited Australia for the 2018 Sydney Writers Festival. Here she is discussing the future of the Commonwealth (it’s kinda like the EU but with more colonial baggage) and her writing. 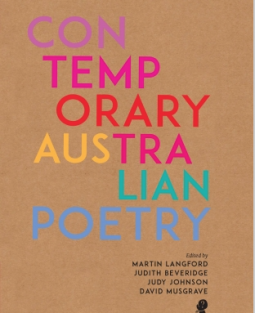 I recently acquired Contemporary Australian Poetry (Langford, Beverage, Johnson, Musgrave eds. , Puncher & Wattman 2016), a fantastic survey of Australian Poetry from 1990 to 2016. (Warning: it will completely distract you from pretty much all writing efforts). Here are a few first lines to whet your appetites. ‘On Christmas Island there are several thousand people locked in the raptor cage from Jurassic Park.’ Happy Christmas! (don’t get tasered), Pip Smith. ‘I go out and get more smack’ Excavation Excavation, Gig Ryan. ‘we live at home, quiet, confined, and our feelings prey upon us / says Austen’ paperweight, Claire Gaskin. ‘This morning the tree-ferns work and opened out / as sunlight dispersed a thick mist’- Via Negativa: The Divine Dark, Robert Adamson.